through a charitable gift today. Texas Student Media trains future journalists, editors, radio producers and TV showrunners through our award-winning student-run media entities. 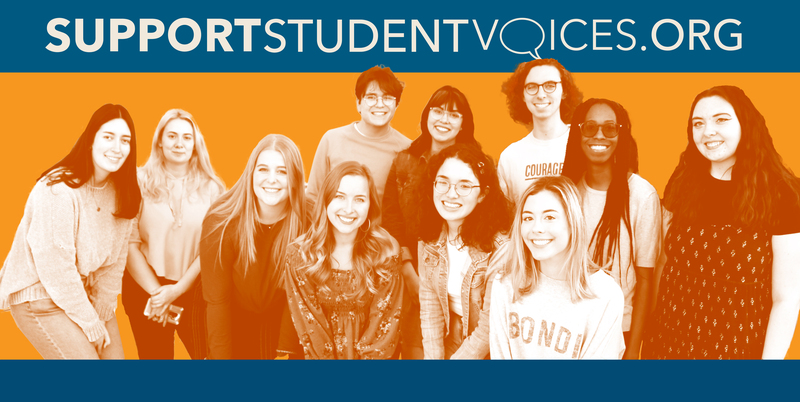 Your support helps us continue to keep UT Austin connected through quality daily news and entertainment. The Daily Texan is the largest and most award-winning college publication in the nation, and our alumni have won 12 Pulitzer Prizes. Help us continue our tradition of excellence with a recurring gift today. KVRX aspires to play "none of the hits, all of the time." We support the Austin music scene by hosting shows and recording local bands on our Local Live show. Help us continue to avoid the hits. The Travesty, UT’s official humor publication, has been voted "Best Non-Chronicle Publication" by the Austin Chronicle 7 times and nominated for Best Sound Mixing at the Academy Awards every year since the paper’s founding in 1997. Help us keep campus laughing. Burnt X an alternative news site and TSM's newest entity. Burnt X is digital first, and engages with people wherever they are, including snapchat, yik yak, and other social media platforms. Help us keep growing our audience and reaching new readers! The Cactus yearbook is the oldest campus publication, and serves as a time capsule for each graduating class. Help us endow our fixed printing and data storage costs to ensure we continue publishing for another 120 years. Donate $100 and you'll receive a complimentary 2018 yearbook. Texas Student Television is the nation’s only student-run, FCC-licensed television station. We have been producing and distributing the best student-made video content on campus for 27 years. Help us expand our roster of original shows. Sign up for The Daily Digest and stay connected to TSM! Sign up to receive daily alerts about the latest news and entertainment on the UT campus and in the Austin community.